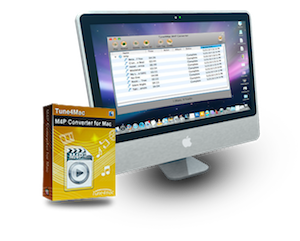 Tune4Mac M4P Converter for Mac is a specially-designed Mac M4P to MP3 Converter to help you convert DRM-protected M4P, M4B, M4A songs you purchased on iTunes to plain MP3, AAC or WAV formats on mac OS 10.8 or later. 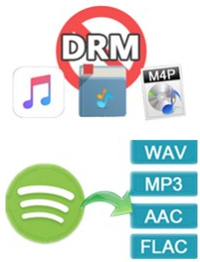 • Remove DRM from purchased iTunes M4P, M4B, M4A to MP3, AAC and WAV. • Support portable devices, like Apple iPod, iPhone, PSP, BlackBerry, HTC Phones, MP3 player, MP4 player, etc. • Virtual CD burner technology is adopted. Compatible OS: macOS 10.8 - 10.12. Free you from the hassles of copy protection. Remove DRM without defeating the DRM copy-protection technology used by your audio files. This means it will function with all copy-protection measures which is completely legal. Remove DRM protection from iTunes M4P, M4B, M4A. Convert iTunes music files to the plain formats to plain MP3, AAC and WAV. Support multiple devices. Converted MP3 files are used to create ringtones, add to a presentation, listen on your iPod, iPhone, Zune, PSP, MP3 player, etc. All-in-one M4P to MP3 Converter for Mac OSX. It converts audio files from many different file formats into MP3, AAC, WAV files, such as M4P to MP3, M4P to WAV, M4B to MP3, M4A to MP3, M4B to WAV, M4A to WAV, AAC to MP3, MP3 to WAV, M4A to WAV and much more. Batch conversion supported. Batch convert iTunes DRM protected or unprotected music files, audio books to unprotected MP3 or AAC files with ID tags preserved. High speed conversion. Convert any music files on your iTunes with high speed and CD-quality. 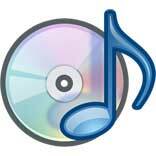 DRM copy-protected audio conversion tool designed for burning DRM protected music to a special virtual CD-RW drive where you can quickly get unprotected MP3, AAC, WAV files ready for use. This virtual CD burner emulator can easily emulates the whole workflow for converting music or audio files to normal music files: ripping, burning, encoding are within only few clicks. Remove DRM lock from iTunes DRM protected M4P, M4A, M4B to MP3, AAC, WAV which are playable on Apple iPod, iPhone, PSP, Zune, BlackBerry, HTC Phones, MP3 player, MP4 player, etc. Virtual CD can emulate your computer RAM and hard disk as erasable CD-RW drive (Virtual CD-RW), the converting speed is at least 10 times faster than any other programs which use recording as one of the core converting tricks. Its ability to convert DRM protected music files into regular MP3 files makes it a perfect solution for people who purchase their music online but have compatibility issues with their MP3 player. "As consumers, I love companies offering solid product guarantees. It proves the company has faith in its product, and is making a solid effort to gain your trust." "I use Tune4Mac M4P Converter for my iTunes music collection. It converts M4P to MP3 and the speed is super fast. Great software."